PPSSPP is a great PSP emulator for all kinds of platforms, including Windows and Android. I recently started using it to play some of my PSP games, and I was surprised how nice a few of them (particularly the stylized ones) can look with some AA and a higher rendering resolution. However, the texture resolution on many of the games is a huge blemish on the visuals. 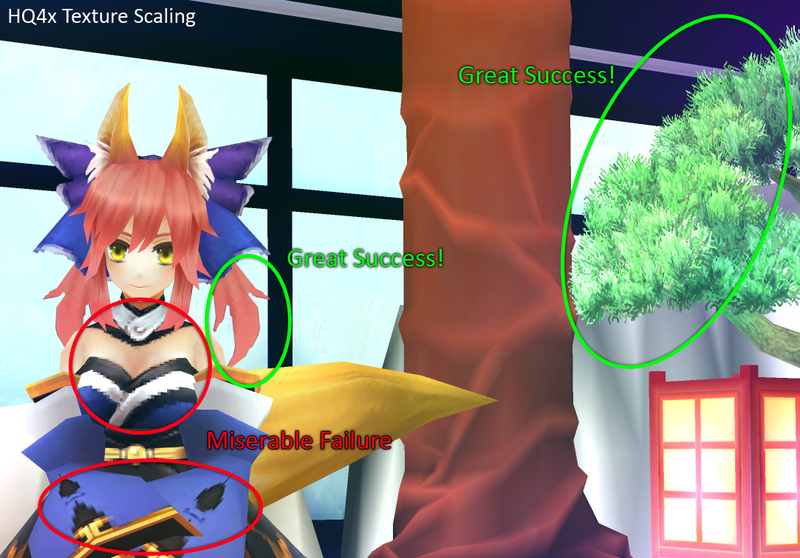 Look at this example (from Fate: Extra): Particularly the hair is absurdly pixelized, but the clothing and tree texture aren’t much better. In general, trying to make a higher resolution image from a lower resolution one is a fool’s errand, as the information just isn’t there. However, for stylized textures such as these I thought something might be done. As you can see, it was pretty effective on the hard transparency edges of the hair and tree textures, but only increased the pixelation on the soft, anti-aliased edges of the cloth. Luckily, scaling of image art has advanced quite a bit since HQx was created, and I soon found an algorithm called xBR created by Hyllian on the byuu.org message boards. The source code for xBRZ, a slightly improved and parallelizable implementation of xBR is available as part of the HqMAME project. It deals much better with anti-aliased edges, and integrating it into PPSSPP ended up looking like this: It’s a generally great result, and better than HQ4x, with one drawback: the posterization of gradients. It’s not too apparent in the image above, but it can be very distracting in other scenes and games (e.g. it can look really bad in sky textures). To circumvent that effect I had to take to Matlab. I came up with an algorithm that calculates a mask based on the local contrast of a texture, and then chooses between xBRZ and bilinear/bicubic texture scaling based on the mask value. The initial version was very slow, particularly with bicubic scaling. So I also parallelized everything and added a SSE 4.1 version of the scaling function. You can try the final result in any recent build of PPSSPP. There are still many things that could be explored for even better automatic texture scaling in emulators. One particular deficiency of xBR for texture scaling is how it deals with the borders of images. It simply assumes that the texture continues as on the border (i.e. replicates it). A better idea for textures could be to assume that the edge direction continues as it does on the border – this could reduce some tiling artifacts that appear when scaling. Another interesting topic would be the replication of noise or small-scale detail on an upscaled texture, but it would require some in-depth analysis of the texture images which might not be feasible in real-time.